The 2014 IPO market is booming as 61 companies have already filed for initial public offerings. Biotech companies like Dicerna Pharmaceuticals Inc. (Nasdaq: DRNA) and Ultragenyx Pharmaceutical Inc. (Nasdaq: RARE) have led the way with first-day gains of 207% and 101%, respectively. 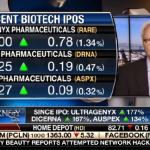 The success of biotech IPOs has led Money Morning's Defense & Tech Specialist Michael Robinson to call this "the biotech century."